If you are looking for an easy, low-maintenance solution for serving a large volume of hot dogs, then a commercial hot dog steamer is right up your alley. 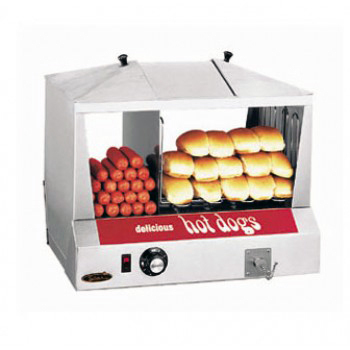 Hot dog steamers heat large capacities of hot dogs and buns, up to 230 hot dogs, in a minimum amount of time and with easy operation. Since these hot dog machines use steam for cooking, your hot dogs will stay plump & juicy and your buns will stay warm & fresh until they are ready to serve. Each steamer is equipped with a clear door and features colorful graphics to attract your customers and increase your sales.